There is an increasingly urgent demand for poverty and living conditions data, in relation to local areas and/or subpopulations. Policy makers and stakeholders need indicators and maps of poverty and living conditions in order to formulate and implement policies, (re)distribute resources, and measure the effect of local policy actions. Small Area Estimation (SAE) plays a crucial role in producing statistically sound estimates for poverty mapping. This book offers a comprehensive source of information regarding the use of SAE methods adapted to these distinctive features of poverty data derived from surveys and administrative archives. 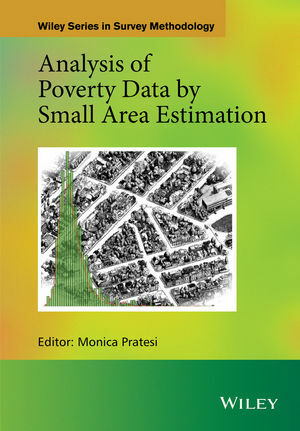 The book covers the definition of poverty indicators, data collection and integration methods, the impact of sampling design, weighting and variance estimation, the issue of SAE modelling and robustness, the spatio-temporal modelling of poverty, and the SAE of the distribution function of income and inequalities. Examples of data analyses and applications are provided, and the book is supported by a website describing scripts written in SAS or R software, which accompany the majority of the presented methods. Analysis of Poverty Data by Small Area Estimation offers an introduction to advanced techniques from both a practical and a methodological perspective, and will prove an invaluable resource for researchers actively engaged in organizing, managing and conducting studies on poverty. Monica Pratesi, Department of Economics and Management, University of Pisa, Italy. Monica's research field includes small area estimation, inference in elusive populations, nonresponse, design effect in fitting statistical models. Monica is currently involved as researcher and reference person of the DEM-UNIPI in the project EFRAME(European FRAmework for MEasuring progress) funded under the 7th FP (eframeproject.eu/).